Lacefield has served in various roles in the agriculture industry, most recently as FNB Bank's Trigg County market president. Prior to this he served as the chief financial officer of Agri-Chem and general manager for Commonwealth Agri-Finance, both divisions of Hopkinsville Elevator Cooperative. 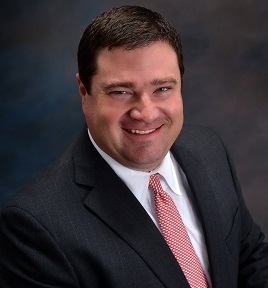 He has also served as vice president of agriculture and commercial banking with Planters Bank and as an area extension specialist with the University of Kentucky Farm Business Management Program. Lacefield has served as a board member for the Kentucky Retail Federation, Kentucky Corn Growers, Kentucky FFA Foundation, and the Kentucky Ag Leadership Program. He holds bachelors and master's degrees in agriculture from Western Kentucky University and a master's in food and resource economics from the University of Florida. He and his wife, Michelle, live in Hopkinsville and have two children, Brianne and Braden. The Farm Service Agency serves farmers, ranchers and agricultural partners through the delivery of effective, efficient agricultural programs. The agency offers farmers a strong safety net through the administration of farm commodity and disaster programs. FSA continues to conserve natural resources and also provides credit to agricultural producers who are unable to receive private, commercial credit, including special emphasis on beginning, underserved and women farmers and ranchers. Under the direction of Secretary Sonny Perdue, the USDA will always be facts-based and data-driven, with a decision-making mindset that is customer-focused. Secretary Perdue leads the USDA with four guiding principles: to maximize the ability of American agriculture to create jobs, sell foods and fiber, and feed and clothe the world; to prioritize customer service for the taxpayers; to ensure that our food supply is safe and secure; and to maintain good stewardship of the natural resources that provide us with our miraculous bounty. And understanding that we live in a global economy where trade is of top importance, Secretary Perdue has pledged to be an unapologetic advocate for American agriculture. As SED, Lacefield will use his leadership experience to oversee FSA programs in a customer-focused manner to ensure a safe, affordable, abundant and nutritious food supply for consumers.